The game of baseball is forever changing. One could almost consider it some form of living organism. The product is always changing and evolving into something much different from what you may have seen years before. It could be the actual play of the game, rules or even subtle changes to position players that have become unique. The role of the closer has been one such animal over the last 60 years or so, that has morphed itself to the forefront of the game. If a team doesn’t have a great stopper in their bullpen, they are going nowhere quick. Todays book takes a look at that changing role straight from the horse’s mouth. 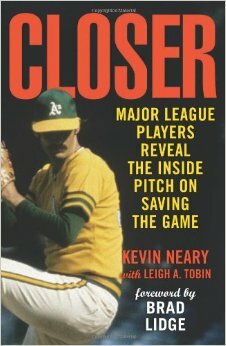 This book takes a rather unique, but definitely effective approach to the role of the closer. You get the information direct from some of the names that have defined the role throughout the years. Starting in the 1950’s with the person whom many consider the original closer Elroy Face, to current day closing specialists like John Smoltz, you get the story of why these roles have become so important. The book breaks down the closer role into three eras. The beginning, the transition years and the modern era. Each section has interviews with several of the pitchers that became closers in their careers during those periods, and how the changing role of the closer within the game affected them. The authors have done a nice job of showing the reader how the player viewed themselves within the game. It shows how the pitcher really fit in the game both before and after they became a closer, and how it changed their careers. There are several Hall of Fame careers that were actually saved by becoming a closer. Some guys had fairly succesful careers before the switch, but everyone interviewed seemed to view the switch as a positive thing for their careers. If you want to see how the game has evolved and read some really good interviews at the same time you should check out this book. The authors did a nice job with it and should be proud of their work.